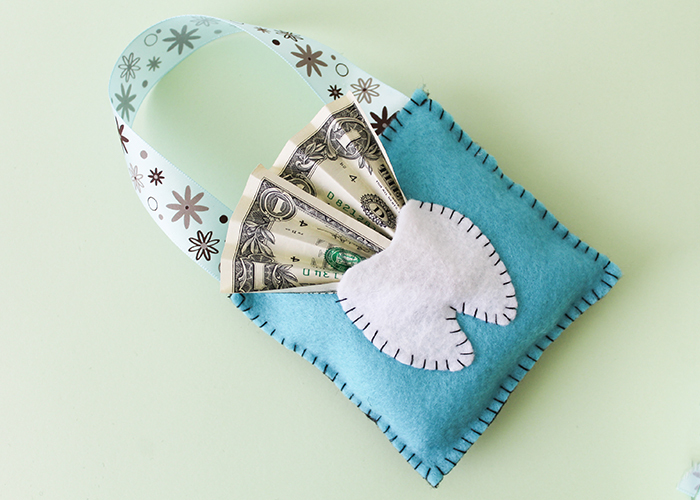 Today we’re going to make this Easy Felt Tooth Fairy Pillow! 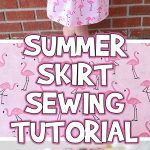 This is great beginning sewing project for young learners, and it can be made with glue if sewing isn’t something you enjoy doing, or you’re in a hurry. Let’s get started! Felt in your choice of colors. Batting or pillow filler. 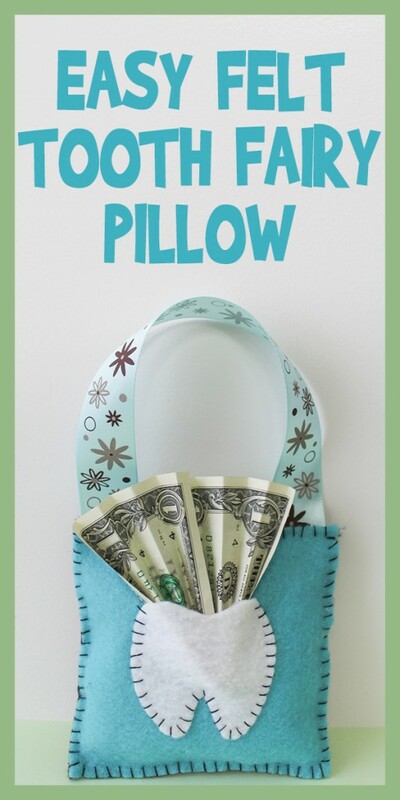 You can also use fabric scraps to stuff your pillow. Thread. I used regular thread, but embroidery thread looks even cuter. 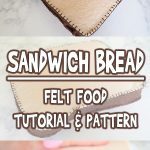 NOTE: If you don’t sew, you can still make this! 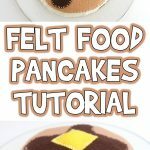 Use tacky fabric glue or hot glue! 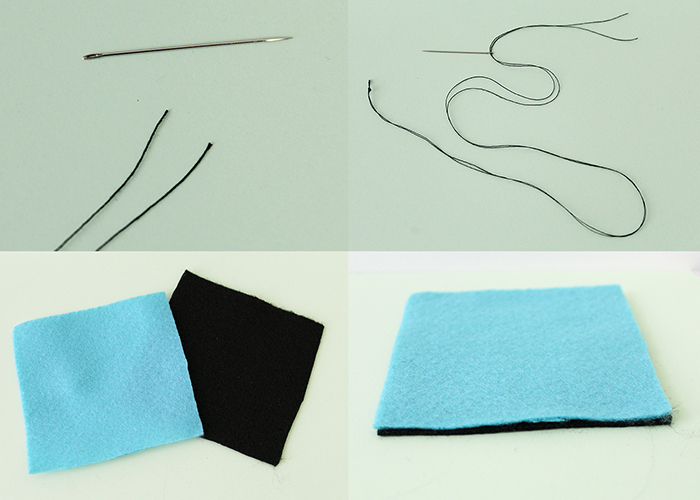 Start by threading your needle with two strands of regular or embroidery thread, and put a knot at the end. Cut out the front and back for your pillow. 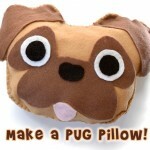 I used two 4 in by 4 in squares, but you can easily make a larger or smaller pillow. Place the squares on top of each other, and make sure the edges can line up neatly since they’ll be showing in the final product. If I were to do this again, I would attach the tooth to the top square before I sewed the square together. 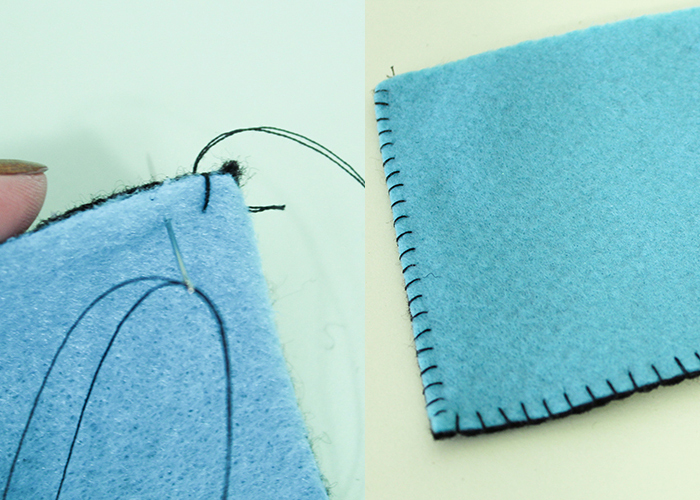 So skip down and learn how to make and attach the tooth to the blue square, and then follow these directions to put your pillow together.Start sewing your squares together, on three sides. 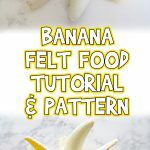 You can use a whip stitch or a blanket stitch, just try your best to keep the stitches at a uniform distance for a pretty effect. 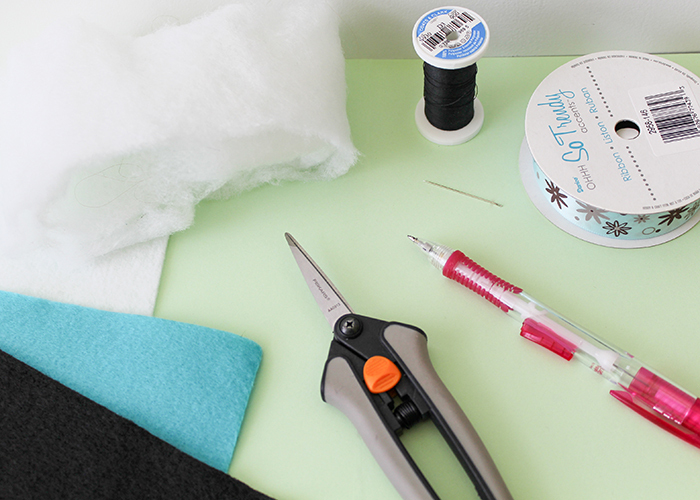 And if sewing isn’t your thing, go ahead and glue three of the sides together. 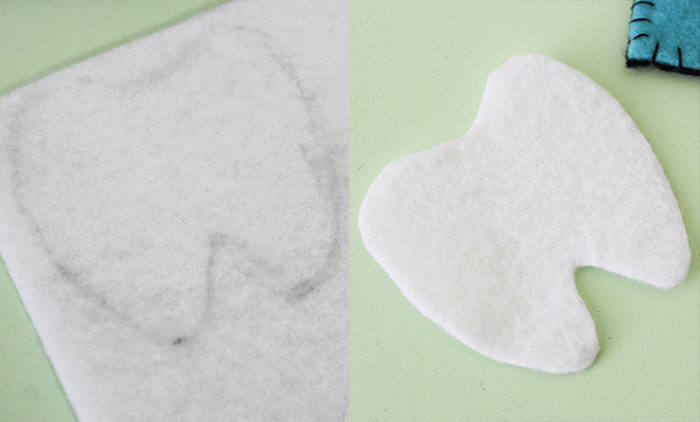 To make the tooth, take your white felt and freehand sketch a tooth with a pencil. The size of your tooth will depend on the size of your pillow, so make sure it will fit on your squares. Don’t be afraid of drawing the tooth, it’s very easy and you can do it! 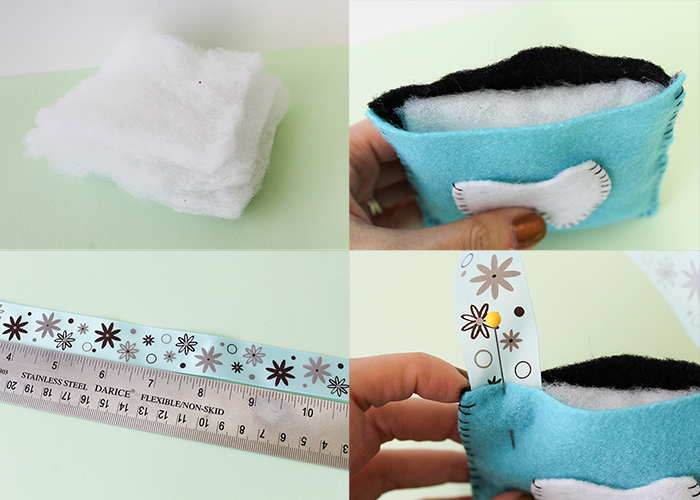 Now we’re going to attach the tooth to the top square of your pillow, which your should do before sewing the pillow together (don’t make my mistake!) 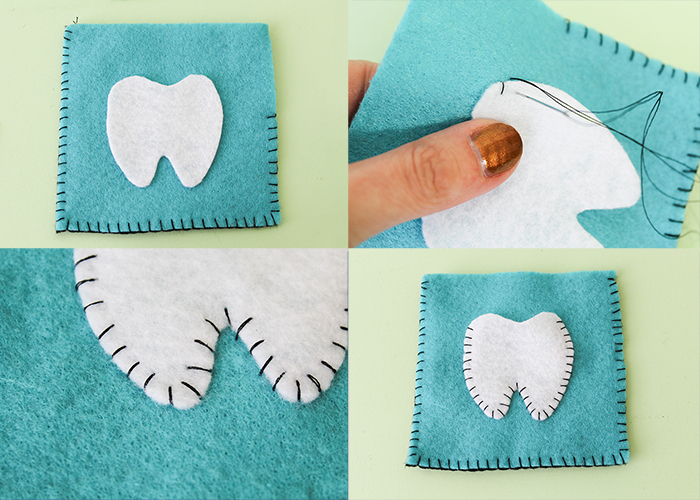 All you have to do is whip stitch the edges of the tooth to the top square, leaving the top of the tooth unstitched so it can hold a tooth and the tooth fairy’s payment. If you’re using glue, just glue the very edges and leave the top loose. Now for the stuffing! I used four layers of thin quilt batting, but you can use poly fill or fabric scraps to stuff your pillow. Stuff it lightly, so it’s not too puffy. 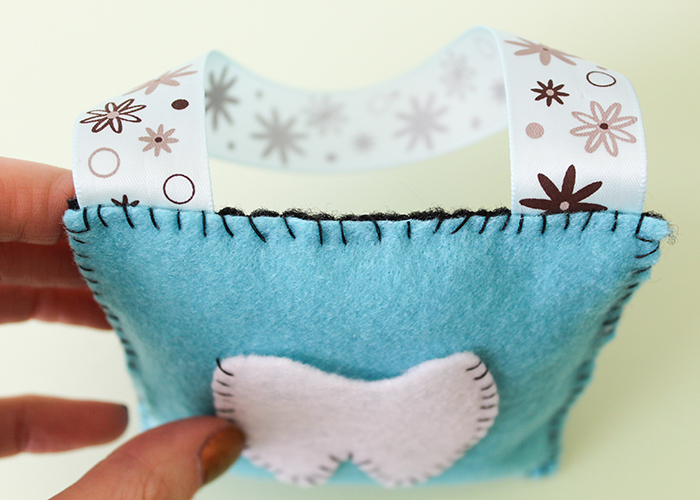 You want to be able to sew it closed easily and still put things in the tooth pocket. 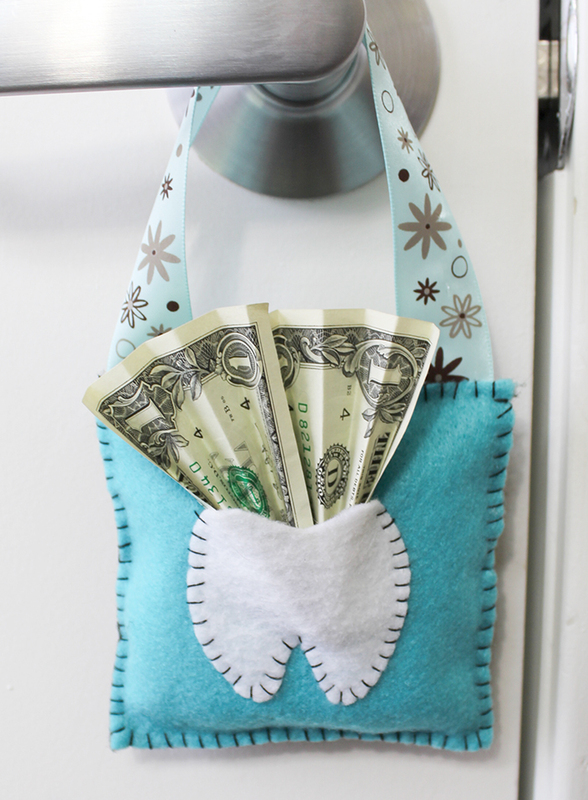 Now if you want to be able to hang it from a doorknob, which is much easier for the tooth fairy to access at night, you’ll need to add a ribbon. Cut a length of ribbon about 10 inches long. 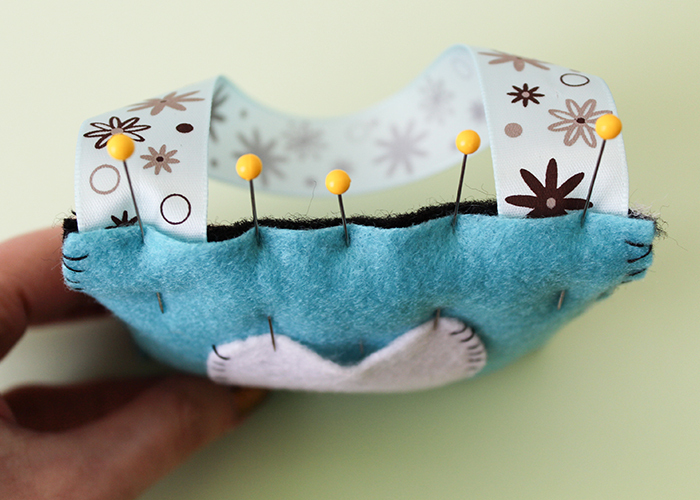 Put each end of the ribbon down about an inch into the open corners of the pillow, and pin in place. Pin the rest of the way across the top. Now whip stitch (or glue!) the top of your pillow closed. And you’re all done! You can put your pillow on a dresser or on your child’s pillow. Or hang it from their doorknob! 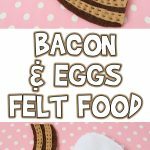 I hope you have fun making this easy felt tooth fairy pillow, and don’t forget to be creative and use their favorite colors!